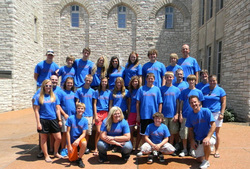 Holy Trinity Catholic Youth - High School LifeTEEN. If you are interested in joining us for a fun and faith based experience with friends, please come to one of the next Sunday night Life Night meetings listed below. Click on the night to find out what we are doing, where the night will be held, and what time it is taking place. All High School aged teens are always welcome! Are you a parent or teen who would like to be the Hands and Feet of Jesus? You're in luck, we have opportunities for you to serve others. Are you or someone you know in need of help? Our Say YES! program would love to help you if we can. Yard Work, Meals, Painting, etc. Click Here to Enter our Say YES! (Youth Excited about Service) Website!